Facebook games. You’ve seen a million of them, all variations on the same thing. Health and stamina. And there’s some “innovative” ones that do things differently. But this isn’t a Mafia Wars post, its instead about one I keep coming back to for years called Nightclub City. The premise isn’t too complicated – you have a nightclub. Take care of your guests, expand the club, and make tons of money and prestige. What makes this one stand apart is the obvious care the developer(s) put into it and how they’re clearly gamers. Not much happening here yet. You make money from your nightclub, and spend it on items to fill it up. Simple enough right ? They’ve made the progression something a bit harder so that not any drunken monkey will ever see the top items. You have to save up your money to buy things. What a concept! Your turntable dictates how long your DJ can play for, and your drink storage capacity dictates how long the bar stays open. You can play the game in “auto” mode where you simply refill the drinks and start the music, then close it down for the 1/2 day or day. You’ll earn money and you can improve your club later. Now this place is more busy. Music shown upper left. The music is actually pretty good, but I am not up on modern music and just assume it’s bands of today. 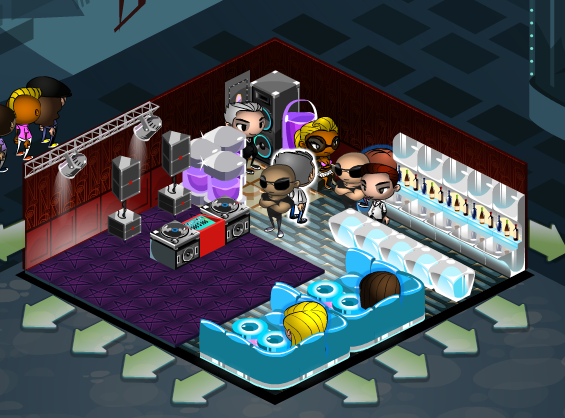 Black Eyed Peas have made an appearance here. Now if you want more of an actual gaming experience, you can get that. VIP Club booths are available and seating customers in them gets fees. You want to look out for the high rollers who pay well when seated. Waiting until the whole place is dancing, you can “drop the bass” and get massive tips. And when your bar is crowded, aka slammed, you can give everyone waiting a drink immediately. 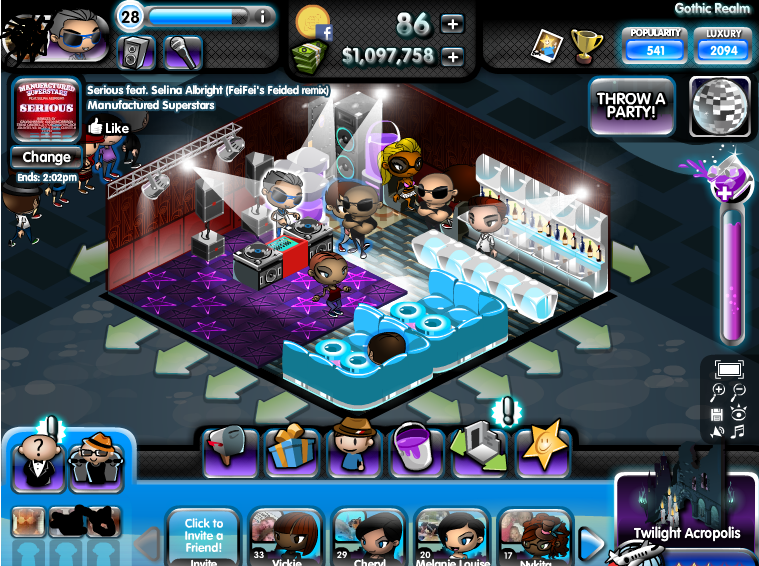 So far I have four nightclubs and am filling three of them out. My starter club is pretty well finished. But it doesn’t have to be – you can also get celebrities to enter your club if you buy them. They’re silly names, but it’s pretty obvious who GW Tush and Richard Slimmons are. This gives you another collecting avenue if you ever have too much money. I haven’t made it there yet. Trying to hit level 50 so I can purchase all the clubs; just made leve 29. It’s a nice casual experience that I get into for a few minutes every night, and sometimes I can spend a few hours messing with my club and seeing what other people have done with theirs. This is a freemium game where the best stuff to buy for your club costs facebook credits; don’t go crazy there people. Give it a try if you like the idea.